K-Seal Expert Advice What is the Difference Between K-Seal and K-Seal HD? What is the Difference Between K-Seal and K-Seal HD? 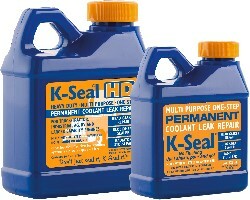 K-Seal is the coolant leak repair of choice for mechanics and motorists around the globe because of its unique versatility and the ease with which it can be used. However, customers might wonder why there are two sizes for them to choose between – what are the differences between K-Seal and K-Seal HD? Well, there’s only one, really: size. They are both used in exactly the same way (by shaking the bottle and pouring the contents directly into the radiator or header/expansion tank where it can mix into the coolant) and are constructed of the same elements (ceramic microfibres and copper particles that mesh together inside holes and cracks to seal them). They both fix leaks in the head, head gasket, block, radiator, heater core, water pump casing, inlet manifold and freeze plug. The cooling systems for different vehicles are different sizes, unsurprisingly – they have to cater for different-sized engines. An eighteen-wheeler truck will obviously run a bigger engine than a Mini Cooper, and the cooling system has to be large enough to cool an engine of that size. With that in mind, K-Seal offers the original multi-purpose K-Seal in two different sizes so that customers are not forced into buying either a bottle that is too small for their needs (thus requiring them to buy two at a time, which isn’t a brilliant way to attract or keep customers) or a bottle that is too big and which might completely flood the system if the whole thing is added to it. If you have any doubts or queries about whether you should use K-Seal or K-Seal HD in your vehicle, get in touch with a member of the K-Seal team, who will be happy to assist you with any other questions you might have.